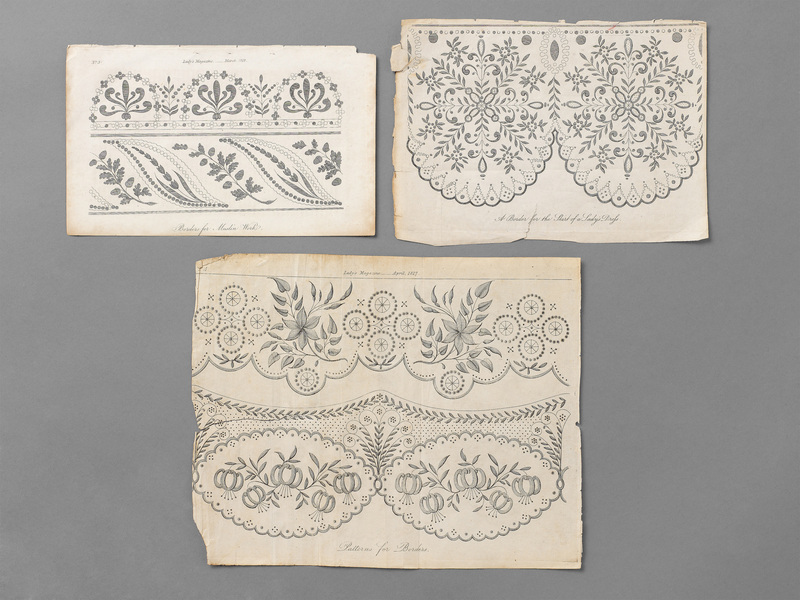 These three embroidery designs, ‘Borders for Muslin work’ of March 1818, ‘A Border for the Skirt of a Lady’s Dress’, not dated, and ‘Patterns for Borders’ of April 1817 were published in the Lady’s Magazine, one of the first and most successful women’s journals in this country, in circulation from 1770 to 1847. Its articles on the latest fashions, the arts and social life were intended to stimulate the mind and creativity of its female readers. Needlework was considered an appropriate accomplishment and leisure-time activity for young ladies. 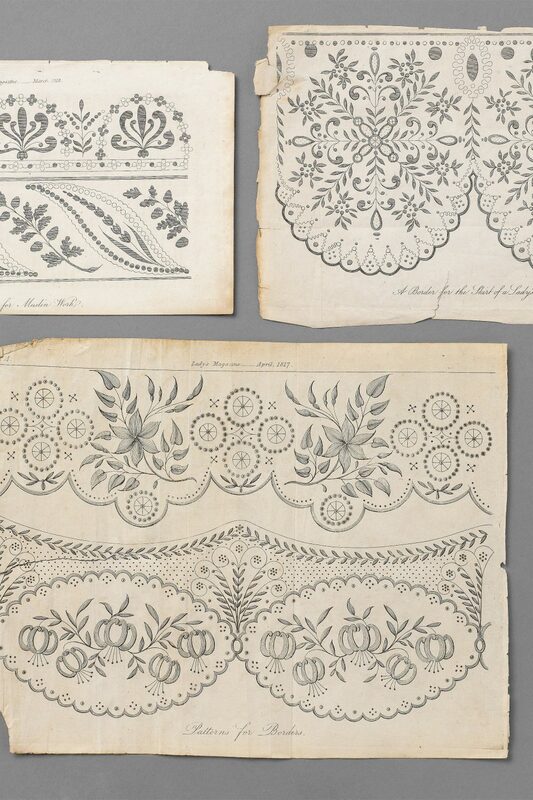 While the inclusion of embroidery patterns in magazines was relatively recent, printed motifs, collected together for the use of both professional and amateur embroiderers, had been available for centuries. The transfer of these designs to the fabric was laborious, involving a number of stages. The benefit of using patterns for muslin work, for which at least one of these examples was intended, was that the muslin could be placed over the design and traced with pen and ink, cutting out much preparatory work. Lady’s Magazine’s embroidery designs were provided for all kinds of garments: shawls, children’s caps, handkerchiefs, and man’s waistcoats, for example. These three designs were probably used for the hems of dresses. The earlier allover sprig dress patterns had, by the late 1810s, given way to those placing greater emphasis upon the base of the skirt. Once completed, the needlework would have been made up into garments by dressmakers, servants, or the embroiderers themselves.